In this article we are providing Palande Courier customer care number, toll free helpline number, customer care email IDs and official contact details. The contact information includes head office address, phone number, fax number, email ID, official website along with customer service details. We are also sharing the way to track couriers online on Palande Courier official website. Palande Courier Private Limited is a well known courier, cargos, and logistics company based in Maharashtra. The company was starter in year 1968. The company offers Express Service, Urgent Service, Local Delivery Service and Time Bound Services to their customers with 300 plus collection pints in almost 200 towns and cities of Maharashtra. It is also offering services of national as well as international courier. “Safety, Speed, Reliability …. always matters”, is the tagline of the company. Planade Courier Head Office Address : Palande Courier Pvt. Ltd., 2/3 Erandwane, Karve Road, Opposite S. N. D. T., Behind State Bank of India, Pune – 411 004, Maharashtra – India. Planade Courier Office Fax Number : +91 – 20 – 25467069. If you have any kind of problem, issues, complaints, suggestions, feedback, review etc. against the company or staff. Then you can follow above mentioned contact information to consult that with the official representatives of the company. To track the courier, you need to go to the official website of the company. You will be able to see Track Your Consignment box. 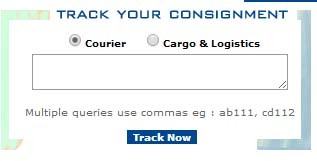 Select the option which you want to track either Courier or Cargo & Logistics. Submit your reference number which would be printed on your receiving slip. In case you want to track multiple consignments then use comma (,) in between multiple reference numbers and click on Track Now button. Use this link to send an email directly to the company. All you have to do is submit your email ID or phone number, write a message and send it. This link will let you know about all the collection centers located in various parts of the state. You can check the nearby collection center to make use of it. This url consists the list of all the delivery locations where the customer can contact. Location wise address, phone number of the the delivery locations are also mentioned on this page. Alfa Laval India Pvt. Ltd is having collection contract with Palande. Now a days your Pimpri collection centre is not taking consignments from suppliers & asking to pay in cash . This is your internal matter . Nobody is answering my mails & I do not know to whom I should escalate the matter . Will somebody contact me & solve my question ? Maine shahu colony se 3/11/17 ko courier karaya tha.2 din ka promise kiya tha 9 tarik ho gayi. Parcel nai mila.bahot ghatiya service hai. Tum logo ko documents ki importance nai hai. Tumhare executive ko baat karne ka tarika nai hai.jhoot bol k kaam karte ho. Ya to shahu colony Pune wale ko band karao ya apni service band kara do. handovered courier on 11th still havent received yet. not very good service,,pathetic experience..offices phone not pickup..anytime..verybad..
pathetic service. Sent courier to Guwahati for my son who was ill . Palande courier person promised that it will be delivered in 4 days. Its now 13 days gone, yet it has not reached to my son. I will really take legal action as all the eatables cant be used now & also as woolen clothes did not reach in time, illness prolonged. I am going to take legal action now. Pathetic….Courier sent on 5th Jan from Mumbai for Pune, not received as of 10th Jan.
Not picking up the phone line and online tracking is not working as well. Correct the spelling . it is written as Planade instead of Palande under contact details on this page. Band karo es sarvice ko…. koi to ph resvd karta he nhi to kya chal ayega courier services…. Bakwas and faltu service … even not responding phone calls. Third class, service nobody can pick the phone, no back answer, faltu. Most important parcel, it is my carrier parcel , total collapsed..
still now i didnt get my parcel . i am going to file a case. the worst palande courier , still i didnt received my courier , 15v days . Please take sever action, on palande courier. Hopeless service. Have sent courier to kolhapur on 26 September. Till date the same has not reached. On contacting people in office they r switching off Mobile. my family had send me one courier before 4 days from Sangli to Pune. ideally it could reach to me the very next day but I didn’t get it. today is 5th day still I am waiting for it. Another thing is there is no response karve nagar office as they are not receiving my call. Now please tell me do I need to visit your office and collect my shipment. Then what’s the use to pay to you. Add. MIDC, Pimpri 411 018.